Here’s an overview of the local real estate market for Arnold, MO, Fenton, MO or Oakville, MO zip codes of 63010, 63026, 63129. February Property sales were 102, down -12.8% from 117 in February 2018 and 7.4% higher than the 95 sales last month. February Year to Date sales of 197 are running -5.3% behind last year's year-to-date sales of 208. The Median Sales Price in February was $197,250, up 3.8% from $190,000 in February 2018 and up 10.0% from $179,355 last month. The Average Sales Price (ASP) in February was $218,138, up 7.8% from $202,316 in February of 2018 and up 7.6% from $202,640 last month. February 2019 ASP was at highest level compared to February of 2018 and 2017. The Total Inventory of Properties available for sale as in February 2019 was 320, up 2.6% from 312 last month and down -34.3% from 487 in February 2018. February 2019 Inventory was at the lowest level compared to February of 2018 and 2017. A comparatively lower MSI is more beneficial for sellers while a higher MSI is better for buyers. The February 2019 MSI of 3.1 months was at its lowest level compared with February of 2018 and 2017. The average Days On Market (DOM) shows how many days the average Property is on the Market before it sells. An upward trend in DOM tends to indicate a move towards more of a Buyer's market, a downward trend a move towards more of a Seller's market. The DOM for February 2019 was 62, down -12.7% from 71 days last month and down -7.5% from 67 days in February 2018. The February 2019 DOM was at its lowest level compared with February of 2018 and 2017. The Selling Price per Square Foot is a great indicator for the direction of Property values. Since Median Sales Price and Average Sales price can be impacted by the 'mix' of high or low end Properties in the market, the selling price per square foot is a more normalized indicator on the direction of Property values. The February 2019 Selling Price per Square Foot of $138 was up 4.5% from $132 last month and up 7.8% from $128 in February 2018. The Selling Price vs Listing Price reveals the average amount that Sellers are agreeing to come down from their list price. The lower the ratio is below 100% the more of a Buyer's market exists, a ratio at or above 100% indicates more of a Seller's market. 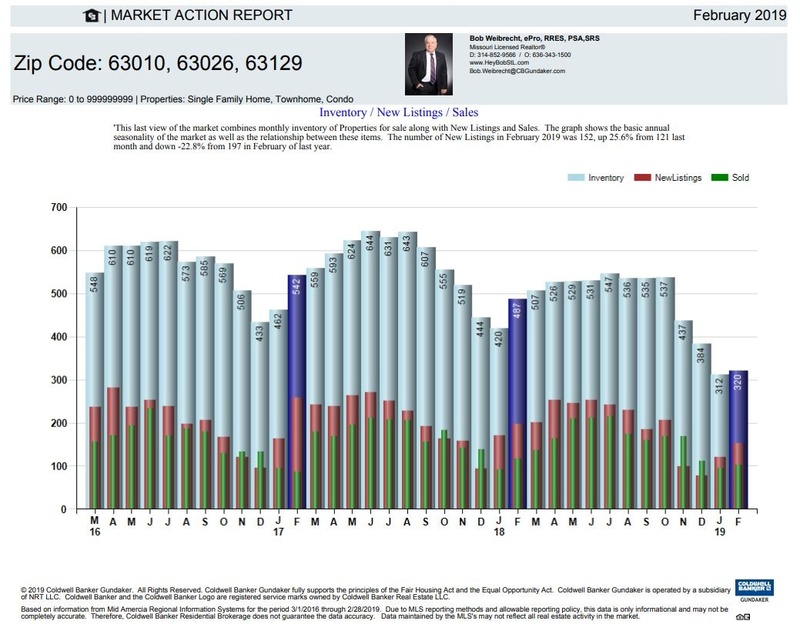 The February 2019 Selling Price vs List Price of 96.3% was up from 95.0% last month and down from 96.6% in February 2018. The entire Arnold, MO, Fenton, MO or Oakville, MO February 2019 report with graphics can be viewed at https://www.facebook.com/download/preview/671851163240173.